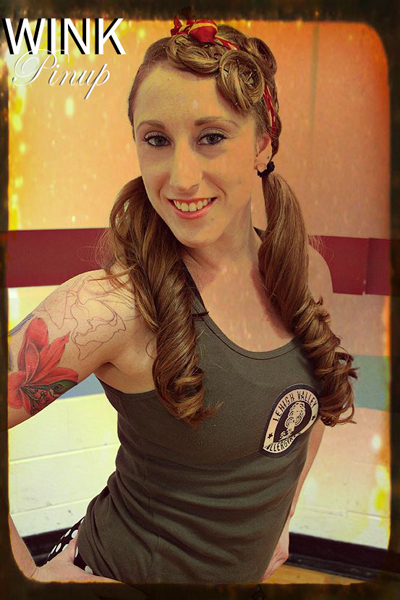 I stumbled upon this awesome photo shoot featuring a few members of the Lehigh Valley Rollergirls in the latest issue of Wink Pinup Magazine. You may remember Wink as a locally available pocket-sized zine. I always made a point to pick up a copy of Wink as soon a new issue hit the street each month. Wink had a nice print run of a year or more and is now available as an online publication. Check out Wink magazine for DIY style, art, pop culture and of course pinups! Each month Wink Features a centerfold, but these aren’t your daddy’s penthouse pets. Want to fulfill your own pinup dreams? You can contact Alison, the Editor of Wink to arrange for your own personal photo shoot; rates are extremely reasonable and include your choice of one or more looks. You never know, you may even wind up as the latest Wink centerfold. Now let’s get to what you’ve been eagerly waiting for, check out the results of the LVRG/Wink photo shoot here. Wink is also on facebook!